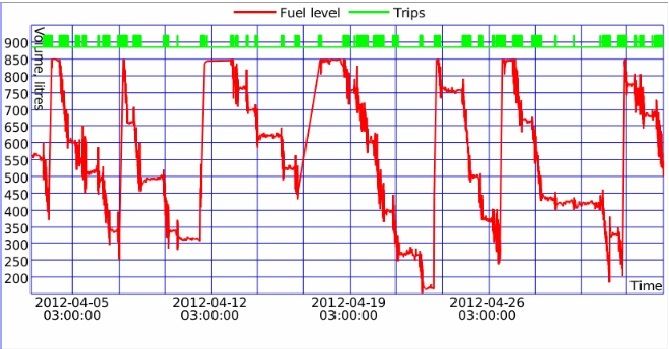 HL-telematics brings to you the ability to monitor and control your fuel costs at all times from your PC. Special Fuel sensors which are developed by HL-telematics are placed on the vehicles and directly connected to our AVL device to allow on line monitoring of actual and total fuel consumption, tank fuel level at an accuracy of 0.7% to 2 % on fuel additions or fuel deductions. All fuel fillings and fuel deductions are saved and able to be viewed by our software daily report. Information such as fuel consuption/trip, average consuption/mile are automatically calculated and added to our reports therefore giving a complete picture on fuel usage and cost. Special charts are also inserted in our software program in order to provide you with a cleaner indication of fuel activity and consumption.